It is a public map so feel free to share. We had a fabulous time at the People’s Climate March yesterday. We made a couple of videos that centred on our Habitat mascot and below are some photos. 2. Some children will run to you and hug you as though you are the essence of all that is good in the world. 3. Other children will look at you and sob hysterically. 4. It is possible to make the NYPD smile (although not without effort). 5. Smiling for photographs is utterly pointless (and yet I did this all day…). 6. People are strangely attuned to your body language. Dancing elicits dancing; bows elicit bows; lethargy… well, you get the point. 8. Your vision is limited both horizontally and vertically, and you are in constant danger of tripping on barricades and other people. If you are ever stepped on by a mascot, don’t take it personally. 9. You are dependent on others to keep you upright and hydrated. Thank you, Tolan, for being the best support crew a bear could wish for… and for still being willing to register for a marriage license with me the morning after. I should also explain one more time that the “Habitat” on the bear’s shirt refers to Habitat the Game, a free app created by my friend and roommate, Kylee Ingram that teaches kids about the environment and sustainability while promoting real world actions. For more information, visit http://www.habitatthegame.com. Here’s to better stewardship of our planet 365 days a year! The winter wonderland will allow players to mirror their portable device and play the game on the large screen. To reinforce the sustainable message a series of displays will be set up to demonstrate the real-world actions required to keep the polar bear alive and happy. 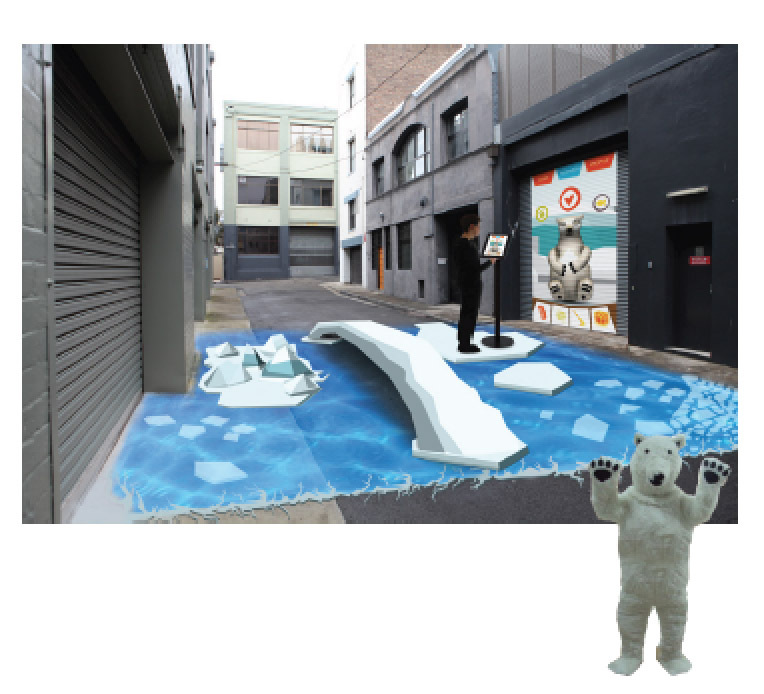 The Installation will represent bear’s habitat by projecting an icy arctic ocean with oversized cardboard icebergs, sheets of ice and life size polar bears inhabiting the cardboard ice world. Team Habitat will also be running an interactive scavenger hunt. There will also be some of Australia’s most popular virtual pins relocated to the area for the day! Players will be able to collect the humpback whale, koala, black cockatoo, kangaroo, including popular Wilderquest series of pins. Find all of the pins and receive a prize! The event starts from 5pm so bring your kids and your phone and enjoy! On September 21, the day of the People’s Climate March, Habitat will place two virtual pins along the March’s Route. These pins will be one off unique pins that kids/players will only be able to pick up on the day of the march. People who attend the climate march will be able to play Habitat and be rewarded for their participation in the march. This activity will be appealing to kids in the march with their parents. Habitat the Game will pop two virtual pins along the route of the march: one at the start in Columbus Circle and the other at the finish at 34th Street. Players will capture these unique pins when they are within 50m of the designated area. The pins will be branded with the 350NYC logo. The first pin the players collect is a climate change pin where the focus of the multiple-choice will be on climate change. The second pin will be an animal pin – the three multiple-choice questions on the pin will focus on what is at stake for the animals.